The scrolls, parchments and scribblings below record the observations of the famed historian Stygtep Tehoth on the elisian people. You will find details regarding all aspects of elisian life and player race stats for playing an elisian in either a Pasts, Personas & Prophecies or Dungeons & Dragons Fifth Edition game. YOU CAN DOWNLOAD A PRINTER-FRIENDLY PDF OF THIS PAGE WITH THE BUTTON BELOW. + Scroll Concerning A brief Hylo History . . . The horned humanoids of Armaduggum have always answered every challenge facing their people with a call to war. To this day their battle-herds roam the frozen tundras of the far east, constantly fighting to survive in the severe environment of their homeland. The karguar's history begins with the life of Karggitt, the barbarian hero of Hyrkan. This human male was once the mortal enemy to Pindarm, a Prime Evil of Hell. In his early years Karggitt took pleasure in slaying those demonic bands that remained in the barbarian lands after Hell's failed conquest of Haven. However, ever hungry for greater strength, Karggitt later abandoned his war against the demons and swore fealty to Pindarm in exchange for increased power. This pact transformed the human hero into a monstrous bison of endless rage. In his new form Karggitt became a slave to his uncontrollable bloodlust, ravaging the eastern barbarian tribes, destroying village after village with ever increasing savagery. Unfortunately, not everyone died beneath the trampling hooves of Karggitt's bloody stampede across Armaduggum. Those women impaled by karggitt's demonic set of horns soon transformed into the first chieftains of the kargaur. Centuries after his transformation, Karggitt came to think himself a god in his own right. He had grown so powerful that he believed himself even greater than his master, Pindarm. In anger, the Prime Evil, bound to the plane of Hell commanded his demon hordes on Asora to slaughter any kargaur village they beset. Those kargaur that survived Pindarm's infernal wrath were issued an ultimatum; either devote themselves to Pindarm or perish. To seal the pact between Pindarm and his new kargaur disciples, the Prime Evil demanded that they turn on Karggitt as a means of swearing their fealty. In desperation, the kargaur abandoned their progenitor amongst the snow drifts and slew him in a titanic battle. Since the fateful day of his death, the kargaur have lived on ruled by a High Chieftain whose throne resides among the colossal bones of Karggitt. + Scroll Concerning Kargaur Physiology . . .
Kargaur stand at an average height of 6’0 ft to 7’6 ft. The color of their thick fur coats varies between an auburn, grey, brown or black hue. The manes that grow behind their set of horns are traditionally worn short or in small braids. A kargaur's appearance blends human features with that of a bison tainted with demonic essence. This fiendish heritage produces offspring who at times bear fanged teeth or blood red eyes. Their prominent demonic appearance, combined with a second pair of muscular arms, produces a fearsome beast which can bring to bear many weapons against a foe. Every kargaur is born with a set of horns, numbering anywhere from one to five, which protrude outwrds from their manes. A kargaur's horns are more than just physical protrusions, carrying a symbolic meaning within their warrior culture. Whenever a kargaur is permitted to live after suffering a defeat, they must remove a horn to preserve their honor. When they no longer possess a horn to ransom back their lives from the victor, they must fall on their swords in order to save face, elsewise they must continue life as a slave to another. + Scroll concerning the Kargaur Personality . . .
+ Scroll concerning Kargaur Lands . . . The subcontinent of Armaduggum produces a kargaur lifestyle far different from that of the horticultural barbarians in Hyrkan. In this tundra region, the kargaur organize themselves into “battle-herds” of up to 2,000 individuals led by the strongest female of their number. It is the young who lead kargaur battle-herds since most wise leaders die in battle before they can age enough to be considered elders. Many times throughout history, this lack of experience among the young chieftains has proven to be the downfall of many a battle-herd as they often charge recklessly into unnecessary conflict. The kargaur live a pastoral lifestyle under the rule of their female chieftains, migrating between volcanic fissures which radiate warmth and promote pockets of life amid the barren tundra. Each of these volcanic sites bear ancient forges carved into the stone. Kargaur craftsmen, esteemed across Asora, use these volcanic forges to create metals with insulating qualities. They then use this smelted metal to create unique armors that keep their warriors warm enough to survive the dangers of exposure in below freezing temperatures. Although the kargaur migrate across Armaduggum throughout most of the year with their large pack animals in tow, they give up their shepherding come winter. Once the ice of the Scar Sea freezes enough so that they may cross the ice by foot, the kargaur raid the neighboring lands of Hyrkan and the Savage South. When the winter raids begin, most kargaur battle-herds temporarily unite under the banner of the High Chieftain in order to pillage as an organized horde. + Scroll concerning Kargaur Religous Practices . . .
Because of their demonic origins, many kargaur are inclined to worship Pindarm as their god. With the Prime Evil of Slaughter and Battle as their patron, the kargaur strive to follow a dogma promoting strength and martial prowess. The more wisened among the kargaur choose to secretly worship the Blue Spirit and his Father-Bull Cult. Adherents of the Blue-Spirit believe that their natural rage was not only the undoing of Karggitt, but the means by which the kargaur destroy themselves. Because of this belief, these kargaur attempt to spread a message of harmony to their people. + Scroll concerning Kargaur relations . . .
Common opinion upholds that the kargaur are nothing but monstrous brutes and raiders. None believe this more than the elisians of the Tablelands who have not forgotten the kargaur's past alliance with the Belkhanid Kaliphate. 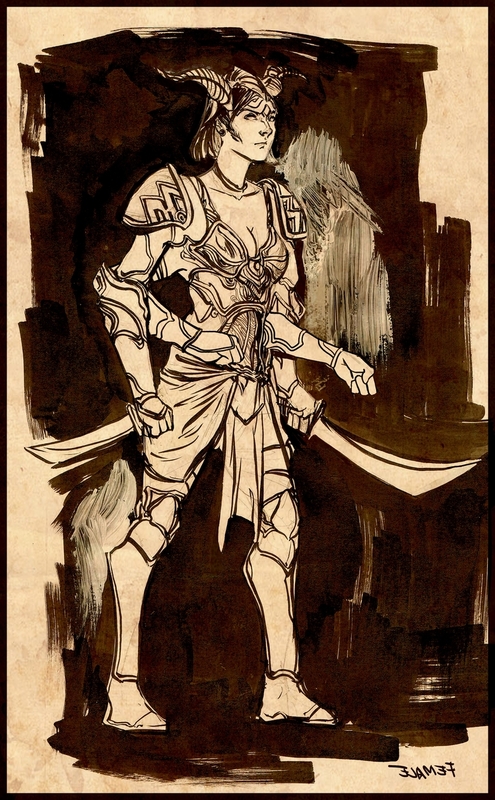 Like the elisians, the humans of Hyrkan also see the kargaur as bitter enemies due to their tendency to cross the Scar Sea to raid the villages of Hyrkan. Most choose not to keep company with kargaur, instead preferring to vacate entire taverns rather than chance their wrath. Some on the other hand see the kargaur as an advantageous asset to have at one's side in a business that involves bloodshed. For this reason most kargaur met outside of their homeland are usually mercenaries working for the highest bidder..
+ Scroll concerning Kargaur linguistic practices . . .
Because the kargaur are descended from the human stock of Hyrkan, they speak a dialect of Auldtangue, the ancient language of their ancestors. When and if a kargaur does happen to learn another language, they tend to pick up Norstari. They do this so that they might better negotiate contract terms with employers in the Jeweled North and converse with the other mercenaries of their troop. + Scroll concerning Kargaur Naming Conventions . . .
At birth kargaur are not given a name, but are called “calf” until their fifth birthday. At that point, a kargaur's parents have judged their child’s personality and name them based off of places, items or animals which exhibit qualities they want their child to aspire to. Alternatively, a kargaur parent might name their child after a great warrior of the past or a respected enemy they themselves once faced on the battlefield. + Pasts, Personas & Prophecies Player Race . . .
Beastly Temperance: At the GM's discretion, a kargaur PC must make a Difficulty 3 Composure check with a -1 penalty when in the presence of either their Greatest Hate or something that angers them immensely. On a failed check, the kargaur makes their current situation worse with their obvious anger or by saying something brash. With 4 Despairs the GM can force the kargaur to initiate combat. Four-Armed Monstrosity: Using the dual-wielding rules, a kargaur may wield a different single-handed weapon in each of their four hands. Alternatively, a kargaur may wield a pair of two-handed weapons; excluding the use of bows and slings. + Dungeons & Dragons Fifth Edition Player Race . . .
Ability Score Increase: A kargaur's Strength score increases by 2, and their Constitution score increases by 1. Age: Kargaur mature at a slightly faster rate than humans. Within their first weeks, they are takining their first huddled steps and reach adulthood by age 10. If able to survive the brutal environment of Armadduggum and the bloody culture of the battle-herds, kargaur can live to be over 400 years old. Alignment: Most kargaur are inclined to an evil alignment due to their infernal heritage. The majority of the kargaur population tend to possess a more lawful nature, respecting the honored warrior-code of their people. Those kargaur that bear greater levels of demonic taint embody the ideals of Pindarm and lean toward chaos. Size: Kargaur stand between 6 to 7 and a half feet tall and average about 250 to 300 pounds. Their size is Medium. Speed: A kargaur's base walking speed is 30 feet. Multi-armed: Kargaur have four arms. As a bonus action, once per round, kargaur may interact with their environment up to two additional times, as long they are not holding anything in two of their hands. In addition, these hands may be used to hold items (such as extra weapons or ammunition), although they do not necessarily grant additional actions to attack. Demonic Visage: Because of their savage appearance, kargaur gain proficiency in the Intimidation skill. Frost-Borne: Kargaur are naturally adapted to cold climates, as described in chapter 5 of the Dungeon Master’s Guide. Relentless Endurance: When a kargaur is reduced to 0 hit points but not killed outright, they can drop to 1 hit point instead. They can’t use this feature again until the finish a long rest. Languages: Kargaur can speak, read, and write Auldetangue and Norstari. Auldtangue is the predecessor language of Norstari and continues to be spoken in the lands of Hyrkan and Armaduggum.